If you have ever been enraged by people who have lost "the four elements", you are likely to be interested in this title. At that moment, you would envision someone's face. But who knows. Someone may be thinking of you. It's a twisted world anyhow, so let's just compromise a little. This is the message that the film 'Killar' originally intends to portray. 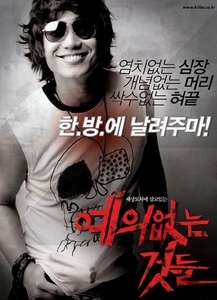 The lead character (Sin Ha-gyoon) is an afflicted man with a lisp. With the childhood memory of a girl who used to protect him at the orphanage, he does not speak for fear of humiliation. Having heard that he can have tongue surgery with 100 million won, he becomes a 'Killar' in order to earn money for the operation. Not a killer, but a 'Killar' such as the 'F-Killer' (a popular insecticide pronounced as 'F Killar' in Korea). Because he filters out the trash of the society, it's a rule he has set following the advice of his senior, 'Ballet' (Kim Min-joon). After work he goes to the bar for a drink, where he meets up with 'Her' (Yoon Ji-hye), a character that covers him with kisses. The silent Killar and Her, who is infatuated with Killar, begins a strange cohabitation. Events unravel one day when Killar and Ballet are told to do away with people trying to earn a windfall from redeveloping the local market, but kills a wrong person by mistake. Killar only utters one word. His narration that reflects his inner thoughts tell all. It is interesting to follow the thoughts of one character. The Killar is a cold-blooded professional killer who becomes soft-hearted when seeing a child, a romanticist that dreams of becoming a bullfighter in Spain, and a character infused with a naivete that writes poems at the level of an elementary school child with innocent gravity. But in the end he is only an outcast that cannot communicate with the outside world. The other characters are the same. They do not have names. They all have their respective pains and are excluded from mainstream society, but all dream of happiness. The main comic feature of the movie is wordplay, such as 'Not ballet but beolle (beatle)' and 'Pygmalion? Pyrl maligetgun (it's frustrating)'. Audiences may either laugh outright or turn a cold shoulder to these quips. The director mentions his intention to "portray the tragedy of these sad outcasts with twisted humor". But Sin Ha-gyoon demonstrates that it is possible to act without words, and to deliver a number of emotions while wearing shades at the same time. Also memorable is Yoon Ji-hye's expression as she throws an alluring glance with the words "Just for digestion, how about a round of exercise? You know, the thing that adults do". His name is Killa. Growing up as an orphan, he had been teased so much for being a lisper that he decided not to talk at all until getting a surgery that would make him talk clearly. Living all by himself, he spends his time doing only two things; watching bullfights on TV and eating seafood. He sometimes writes poetry and spends most of his time daydreaming about becoming a matador to fight face to face with a bull. In order to earn money for the surgery, he chose to become a killer. However, he has his own rule; kill only those with scary faces or with bad manners. Everything seems fine until his boss shows him a picture. The last prey he has to kill is the one who he has never expected to kill. And there is another secret hidden behind the mysterious client of this whack jo.